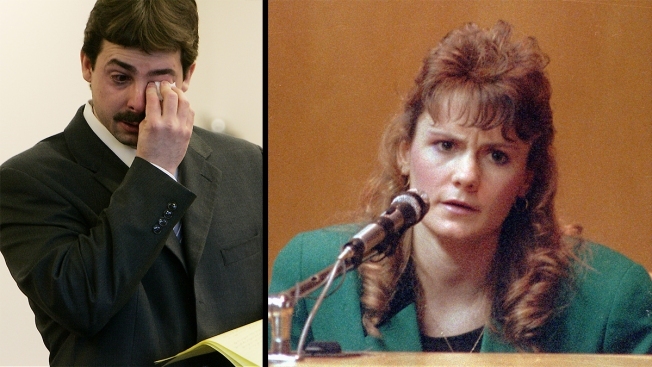 Billy Flynn, left at a sentencing hearing in 2008, was charged with killing the husband of his lover, Pamela Smart, right shown testifying in 1991. A judge has ruled that the gun used to kill Pamela Smart's husband Gregg in 1990 will be returned to its owner. The Portsmouth Herald reports Rockingham Superior Court Judge Andrew Schulman ruled this month that Vance Lattime Sr. is entitled to have his Charter Arms .38-caliber revolver returned. Prosecutors say the gun was stolen by Vance "J.R." Lattime Jr. so Winnacunnet High School classmate Billy Flynn could murder Gregg Smart in the couple's Derry, New Hampshire, home. Pamela Smart, then a media coordinator at the school, convinced Flynn to kill her husband, prosecutors said. The two were having an affair at the time. Prosecutors argued the state should keep the firearm given Pamela Smart's history with seeking parole. Schulman says the revolver wouldn't be needed in any potential appeal scenarios.